Nothing screams mid west like a work trip to Omaha Nebraska and Tulsa Oklahoma. My coworker and I decided to drive through Kansas rather than trying to fly from Omaha to Tulsa. Of course, we stopped along the way in hopes of getting a life bird - Prairie Falcon. You may remember that Lori and I tried to see one of these birds in Amish country a few years ago but dipped. Spoiler alert - I dipped again at Shawnee State Park outside of Topeka Kansas. We did get to see many other hawks including Harlan's race of Red-tail which is black, a few Rough-legged Hawks and a dozen Northern Harriers. No falcon. Sigh. And no photos of the hawks. I think something is wrong with the focusing on the camera. 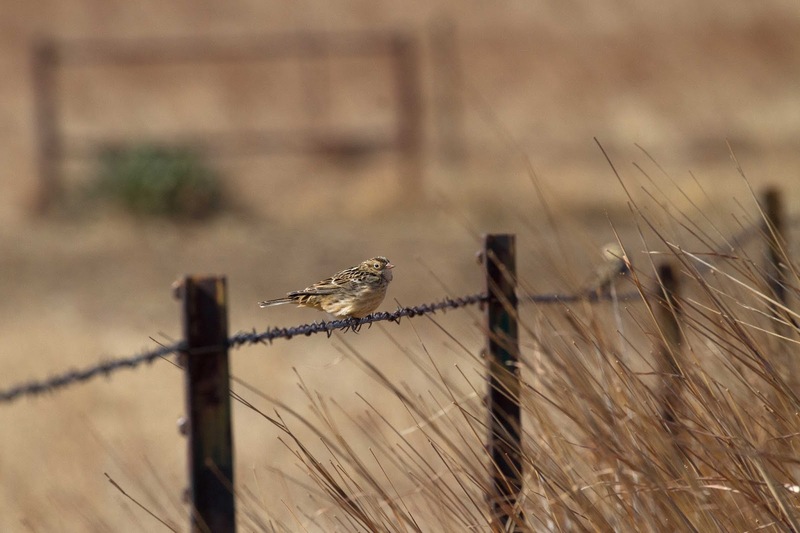 The big prize for me was stumbling across a flock of Smith's Longspurs in the grassland. I have only seen one of these birds which wandered to Stone Harbor Point a few years ago. My friend Harvey actually discovered that bird. Seeing this flock in natural habitat was really cool. 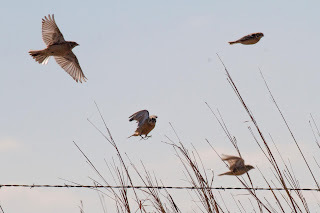 Here are a few of them landing on the barbed-wire fence. You can see the "long spurs" on the middle bird. Here is one perched. This little guy/gal let me get really close. Others were in the grass practically at my feet. You can see the orange wash on the belly which is a good field mark to separate Smith's from other longspurs. Close up view. You can see how they would disappear in the grass due to their great camouflage. The crazy thing about this trip is that we were in "Tornado Alley" with beautiful weather while the east coast was getting hammered with tornadoes. Crazy. 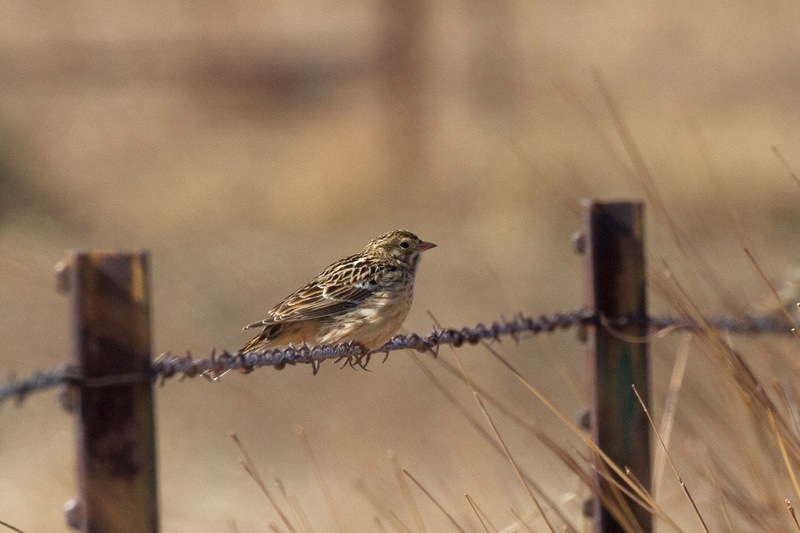 Speaking of Sparrows . . .